Boulder Canyon Natural Foods are so great for Back To School, and a nice treat after school! I was especially in love with the Sweet Potato Fries, they are sweet and crispy! Avocado Oil Canyon Cut potato chips are cooked in 100 percent avocado oil and are flavored with just a touch of sea salt. Contains only natural ingredients and no trans fats, no cholesterol and no MSG. In addition, they are gluten free, Kosher certified and Non-GMO Project verified. Olive Oil Canyon Cut chips are cooked in 100 percent olive oil and feature a tasty combination of sea salt and cracked pepper. Contains only natural ingredients and no trans fats, no cholesterol and no MSG. In addition, they are gluten free, Kosher certified and Non-GMO Project verified. Baked Sweet Potato Fries are seasoned with just the right amount of salt to complement the natural sweetness of the potato. Baked Sweet Potato Fries are made with natural ingredients and feature no trans fats, zero cholesterol and just one gram of saturated fat. In addition, the snacks are gluten free, Kosher certified and Non-GMO. i have and i love 'em! 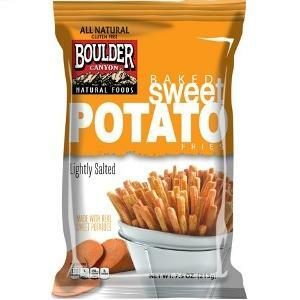 I have tried sweet potato fries and love them. Yes, I eat sweet potato fries and chips often. Yes I love sweet potato fries! No, I have not tried these. I never heard of them before. Yes, I have tried sweet potato fries. I really like them. Yes I have and they are very yummy! They're good with some sea salt on them. No, not yet! This would be a treat! no I have not tried them but they look good ! I have tried sweep potato fries and they taste great! No, I have never tried sweet potato fries. I have and LOVE them! I have tried them! Very good! Yes, I love to make them! yes, and I LOVE them!!!! Sweet AND salty! No, I haven't tried them. No, I have not tried sweet potato fries. Yes, I have tried sweet potato fries and they are very good. Yes; sweet potato fries make my toes curl! No I haven't but I love sweet potato chips so I would love to try these. No but I want to. I love sweet potatoes. Yes and I like them. We have tried them. Some family members love them and some really don't! Haha. I have tried sweet potato fries but not the chip kind.